Take the avocados, peel and seed them then put into a blender with the milk and make a purée. Pour the purée into a mixing bowl, add the sugar, lemon juice and cream and beat until creamy. Then transfer the complete mixture into an ice cream maker and follow the manufacturer's instructions. ice cream makerOwning your own ice cream maker means you can have delicious homemade ice cream in as little as 20 minutes. Ice cream makers come in a variety of shapes and sizes; some are simply manual mixers which require the batch to be frozen for a few hours before its ready. Then theres the electric ice cream maker - with a built in freezer it usually comes with full instructions and recipes. 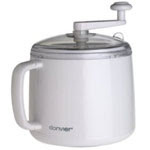 Photo shows a typical example of an electric ice cream maker. Sebagai selingan, sajikan Es Alpukat Kopi ini. Pas untuk menemani Anda bersantai dalam segala suasana. * Campur alpukat dengan cairan kopi dan sirup vanili.